Pat Garrett. I don’t know how many people who aren’t at least 35 years old have a chance of knowing that one. Even over 35 the pickings are still slim I imagine. It was a random question from what I believe to be the original Trivial Pursuit game. Trivia, much like Scrabble like games that I mentioned in a previous blog, has made a splash lately. I don’t know when it started getting big at bars or restaurant/bars with their trivia games but it has to be over a decade ago. It is a great way of people getting together and having a good time showing the world just what they (don’t) know. I, myself, have been attending trivia nearly every Wednesday night for probably the last 3 or so years at a local restaurant/bar. I’m average at best as far as trivia buffs go. The limited amount of knowledge I have on file in my head isn’t often useful for bar trivia. If I could swap out my knowledge of backgammon, cards, and tennis to know everything about the Kardashians, current pop music, and college sports I’d be a much greater asset to my team. Still, I probably enjoy trivia night as much as anyone even when I am unable to recall what beer Brewery Laverne & Shirley worked for. It all kicks back to the original Trivial Pursuit pictured above. It was so much simpler back then. There was no internet and the onslaught of daily information didn’t exist. Two trays of cards was entertainment for years. 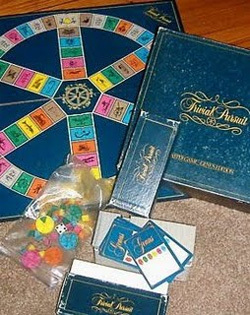 We have many variations of Trivial Pursuit in our house now from Genus (original, 1981) spanning through some of these editions. I still enjoy playing the original because I still miss a ton of questions and there are other questions where the answers has changed over time and you have to try to put yourself in 1981 to find the right response. The 1981 Genus edition is the only one that I know what the categories mean without having to look at a card. I remember I was pretty strong at the orange questions, SL, or Sports & Leisure whereas if I had a modern version with modern sports questions I would fail completely. Science and Nature, or SN, was a good fallback because it often coughed up a multiple choice question and I could do reasonably well in the big G, Geography. The rest were total hit or miss for me and to this day it’s still a great way to pass what seems like too much time if I can get anyone to play. You’d think I would have learned more over the years. I remember one question, in particular from a 1990’s edition. I believe it was under Gen Know (what colour was that?) that asked: “where on a plane is the safest place to be”? A question influenced by current affairs of the time.